A very common way to cary water and beverages for militia and civilians. Our new design hand sewn leather covered water bottle comes with a oil tanned leather strap and brass buckle. These hold are 750ml of your favorite tasty beverage. You will not only be both historically accurate but just think, your water will never taste like tin!!! A three days ration of hand baked Ships Bread made from an original recipe. Approximately 15 pieces per order, baked hard to last a long time in various conditions. Hand stamped with the King's mark. These are great for demonstrations. If you do want to eat them, you will need to soften in water or coffee. They are baked very hard like the originals. Comes complete in a linen bag. Dont want a full three days ration? How about one days ration of hand baked Ships Bread made from an original recipe. Approximately 5 pieces per order, baked hard to last a long time in various conditions. Hand stamped with the King's mark. These are great for demonstrations. If you do want to eat them, you will need to soften in water or coffee. They are baked very hard like the originals. A simple and efficient item that is necessary for any backcountry traveler. Carry your blanket or entire bedroll and added camp items with one of our tumplines. 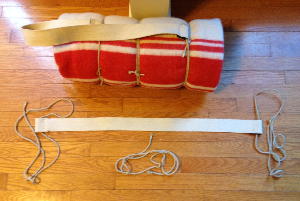 These items are hand sewn using two inch hemp strap and use 4mm hemp rope as ties to secure your load to the strap. Good for trail or carrying items to an event or living history event, you will quickly find that this is one of the most versitile and important items in your histroical kit.